Blogger has a remarkable Template designer that helps you in customizing your themes and templates. The designer tool helps you to change the background, fonts, color etc, but it does not allow you to change its appearance. Often we get emails from users that how we can design a custom Blogger template without learning HTML or CSS coding? In most cases, people prefer to hire some developers but a person who is new to blogging, perhaps he is a beginner cannot pay thousands of dollars to a professional web developer. Using Artisteer you can create your very-own custom blogger template within few minutes. Today in this article, we will discuss How to Create a Professional Blogger Template using Artisteer. 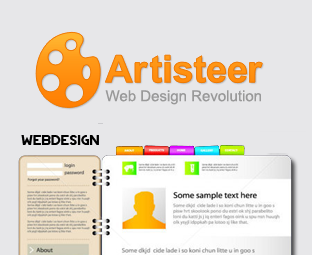 What is Artisteer – Web Design Software? Honestly, the combination of CSS with HTML is incredible, but guys who don’t want to get their hands dirty with some confusing coding could always prefer Artisteer. It is the first web based automotive web design software that supports almost all foremost blogging platforms like Blogger, WordPress, Jhoomla and Drupal. It instantly creates themes and templates for your website through just drag and drop there is no need of HTML or CSS coding. Following are few prominent features of this software. Allow you to design incredible web templates not in minutes, in seconds. Create different pages for your website using drag and drop options. There is no need to learn Photoshop, CSS, HTML or any other web designing language. The First thing you need to do is to Download and install Artisteer. Just like Codelobster this software is also not a freeware. However, its trial version still allows you to create, export or import web templates so if you want to buy a premium version then it’s your choice because trial version works as good as the paid one. The installation wizard is quite straightforward, just follow the instructions as it guides through the installation. Once installations finishes open the software either from your start menu, or from your desktop. After opening Artisteer, the next thing is to create a new template document so go to File >> New. Now a new wizard will appear asking you to select a CMS (Content management system). It supports four most popular CMS system i.e. Blogger, Drupal, WordPress, DukeNetNuke and Jhoomla. Since, you are trying to create a blogger template, so you would select the “Blogger” icon. However, you can also work on other CMS themes. Once done proceed to the next step. Now you would be able to see a Simple blog theme, using the custom functions you would convert it into a professional theme. To start off you have to design your header area. On the tool bar there is an option known as “Header” just select it as shown in the screenshot below. It will provide you numberless option through which you can change the width, height, background, position and lots of other things in your header. In fact, you can also use ready-to-use Flash and gradient background effects. Doesn’t that sound interesting? You can also use “Suggest Header” tool that assists your design and automatically applies a design that matches your color scheme and style. Every blog has a sidebar that usually appears either on the left or right side of a website. On selecting “Sidebar” from the toolbar, it would provide you a few options. You can change the layout, add two sidebars, and can even customize it appearance. If you wish to add two sidebars in your website select “Layout” from the sidebar menu which would provide you a couple of options such as one column, two columns and three columns. You can select it according to your needs. There are lots of other options like styling and coloring your sidebar. You can experiment all the functions and can create a new thing every time you play with them. However, if you have no idea how to style the sidebar, then you can try the “Suggest Sidebar” tool and this software would advise a few modifications. Post pages are the basic need of a website. Without having a proper post design your blogs remain empty or incomplete. To design impressive post pages select “Article” button present on the toolbar. It would take you to a list of options that can help you in creating an ideal post pages for your site. You can Change the Heading style, fonts, color, Blockquote and appearance of your post area. All tools are there to help you, you can experiment each of them and can convert your theme into a masterpiece. Footer: You can also create a unique footer area for your site using the “Footer” button located on the tool bar. It doesn’t have lots of options for customization, but they are enough to create a decent footer. Menu: By default, you get multi-drop down menus, so you do not code them from scratch. However, you can customize theme accordingly from the “Menu” button. It has a lot of options for customization. Background: Using the background tool, you can either upload image backgrounds or can use the custom gradient color backgrounds. You can also add texture to your background using the same tool. Layout: You can either use full-width layout or can select a certain width using the “Layout” option located at the toolbar. You can add border to your layout, texture, and other fascinating stuff to play. 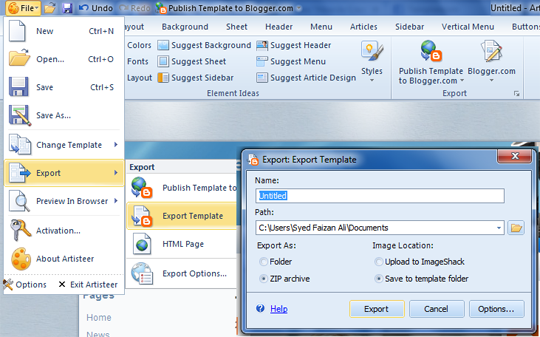 Once your template is ready, it is time to export so that you can upload it on your blog. Go to File >> Export >> Export Template >> save the file. Remember: The file would be saved in .zip extension, so you need WinRAR to unzip it. The package would consist of two files i.e. the main blogger template in .xml format and a folder of pattern images. We hope this article answered all the related questions like how to create a blogger template without having any CSS or HTML knowledge. If we have left something uncovered, or you know some better method of creating themes then please leave a comment below. 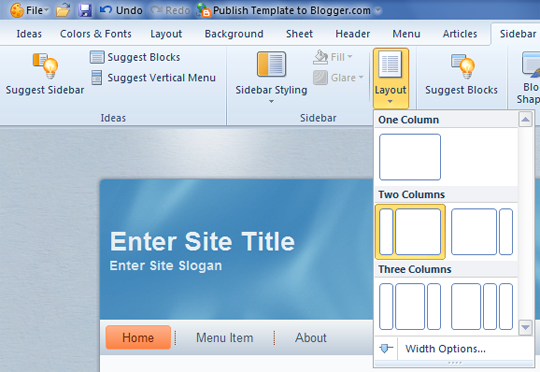 Nice tool for creating the blogger template. syed you have given my that two links about.html and something about syed. but i did not find your location there. so again i would like to say that i need your province name and district name. i am just only waiting for you. i will soon publish my to 10 bloggers in pakistan of 2013. Ok faizan i have found you location do,nt mention. Thanks Syed. Awsome post. Love to use this tool. Syed! in trial version every image has watermark "TRIAL". So trial version is useless. You must have to purchase this software to use it. Great stuff as usual. Thanks Syed. What are the limitations of trail version. So Does Templatism uses Artisteer to Create a Blogger Template ? Is there any possibility to edit my current blog with Artisteer? Can you make two separate top menus using Artisteer for Blogger? Hi when i export a template already available in artisteer to blogger.. it does not look same as it is in software itself.Specially the front page with images and various icons.. its all gone when uploaded template to blogger. i used automatic blogger export feature. I created the template with this software but when i uploads it on my blogger blog, It's showing some XML error ... What should I do?